1. How bright and festive is our city and how more brilliant this day than the rest of the year, not because the sun is today sending to the earth rays that are more visible than usual, but because the holy martyrs’ light is lighting up our city well beyond any lightning flash. For they are more brilliant than ten thousand suns and more visible than the major stars. Because of them today the earth is more majestic than heaven. Please don’t mention the dust, nor think about the ash, nor the bones that have been consumed by time, but open wide the eyes of faith and see God’s power that accompanies them, the that surrounds them. The rays sent from the sun’s orbit to the earth are not of the same type as the flashes and glitters that bound forth from these bodies and blind the very eyes of the Devil. For just as when the leaders of gangs of thieves and grave-robbers see imperial weaponry lying casually around—a chest-plate or shield or helmet, gleaming all over with gold—they immediately jump back and dare neither to approach nor to touch, suspecting great danger if they were to dare anything of the sort; so too, in fact, wherever the demons, the true leaders of gangs of thieves, see martyrs’ bodies lying around, they flee and immediately jump back. For they don’t have regard to their interim mortal nature, but to the ineffable dignity of Christ who wore them. After all, these weapons no angel, no archangel, no other created power has put on, except the Master of angels himself. And just as Paul proclaimed as follows: “Do you seek proof of Christ who speaks in me?” (II Cor 13.3), so they too can proclaim and say: “Do you seek proof of Christ who competed in us?” For their bodies are precious, since they received blows for their very own Master’s sake, since they bear identifying marks because of Christ. Indeed, just as an imperial crown decorated all over with a diverse array of gems emit different flashes of light, so too the holy martyrs’ bodies, since they are marked with wounds, like precious gems, for Christ’s sake, appear more valuable and majestic than any imperial diadem. 3. So, whenever you see a woman, who is shaky, elderly, who requires a walking-stick, entering a contest and destroying a tyrant’s rage, defeating incorporeal powers, conquering the Devil with ease, smashing his strength with considerable force, marvel at the president of the games’ grace, be astonished at Christ’s power. The athletes are not vigorous in the flesh, but they are vigorous in their faith. Their constitution is weak, but the grace that sustains them is powerful. Their bodies are disabled by old age, but their thoughts are trained by the desire for piety. The contest isn't perceivable. And so don’t get to know every aspect of the athletes externally, but enter their reason to find the prime condition of their soul. Get to know every aspect of the strength of their faith, so that you may learn that the person who boxes with demons doesn’t require a strong physical shell, or to be at the prime of their life; rather, even if they’re quite young, even if they’ve reached extreme old age, yet have a noble and healthy soul, nothing stemming from their age will cause them harm in the contests. 4. And why do I mention old and young, where, at any rate, even women stripped off for these wrestling matches, and wove brilliant crowns? My point is that, whereas in the games in the outside world they scrutinize both age and gender and status, and entry to them is closed off to slaves and women and old men and adolescents, here the theater is opened up with complete safety to every status, every age group, and each gender, so that you might learn in full the generosity and ineffable power of the one who set up the contest, and see that apostolic remark certified in practice: “his power is perfected in weakness” (IICor 12.9). For whenever children and old people exhibit unnatural strength, the grace of God who works through them is brilliantly revealed in every respect. 5. Indeed, that you may learn that the athletes’ weakness, namely the external one, renders the crowned winners more brilliant, come on, let's dismiss the old man and the children and turn our focus to the weaker among them—the wife, the old woman, the mother of seven children. For truly her labor pains are no small obstacle for these wrestling matches. So, what quality of hers deserves our wonder first? The weakness of her gender, or the maturity of her years, or the fragile state of her compassion? For these truly are substantial obstacles for the race that requires such great endurance. Yet I can mention an even greater one than these, through which we shall view both the woman’s courage and the Devil’s malice in full. What is it? Consider the foul demon’s wickedness. He didn’t drag her into the arena first, but escorted her to the wrestling matches after her children. What on earth for? So that by depressing her will first through the tortures of her seven children, and softening the firmness of her resolve, and with her strength spent in advance on the punishment of her offspring through her watching what was taking place, he might then easily attack her in her weakened condition. 6. Indeed, don’t look at that fact—that they received the tortures—but consider this—that she endured the pain more severely with each and every one of them, and was slain with each and every one of them. And all women who’ve experienced childbirth and become mothers know well what I mean. At least, often when a mother sees a small child burning up with fever, she would choose to suffer anything to transfer the fire of the illness from that body to her own. This is how mothers think—that the sufferings of their children are more unbearable than their own ills. If this is true-—-as it certainly is true—the mother was punished more severely than her children in her children’s tortures, and the martyrdom was greater in the mother than in the children. For if just hearing of the illness of a single child churns up its mother’s stomach, what wouldn’t she have suffered when she didn’t receive what was happening through hearsay but discovered by sight the sufferings of not a single child, but such a large group of children as they were being killed? How wasn’t she driven out of her mind when she saw each of them being killed slowly by certain diverse and terrifying tortures? How wasn't her soul ripped out of her body? How is it that from the first sight she didn’t leap into the fire to free herself from the rest of the spectacle? For even if she were a philosopher, she was still a mother. Even if she were beloved of God, she was also clothed in flesh. Even if she were zealous, she also shared a woman's nature. Even if she seethed with the zeal of piety, she was also restrained by the bond of childbirth. For if often we, who are men who have no duty of friendship towards the person, when we see a condemned person being led through the agora with the cord at their mouth, being dragged to the pit, are shattered by just the spectacle, and yet we have sufficient comfort that we’ll suffer nothing of-the sort, since the person has been condemned for their wickedness, what isn’t it likely that she suffered when she saw not one condemned person being led away, but seven children felled in one stroke on a single day not in a concise termination, but by various and diverse butcheries? I mean, even if a person were made of stone, even if her stomach were made of steel, wouldn’t she have been utterly churned up, wouldn’t she have experienced something of the kind both a woman and mother were likely to feel? Reflect on how we marvel at the patriarch Abraham, because he offered up his own son and bound him hand and foot and put him up on the altar, and then you will see well how great the woman’s courage. 7. O that utterly bitter and utterly pleasurable sight! Utterly bitter because of the nature of what was taking place; utterly pleasurable because of the outlook of the woman watching. For she didn’t see the blood that was flowing, but saw the crowns of righteousness being woven. She didn’t look at the ribs that were being pierced through, but looked at the eternal dwellings under construction. She didn't see executioners standing around, but saw encircling angels. She forgot her birth pains, she scorned her nature, she ignored her age. She scorned her nature, a tyrannical thing; nature, which usually controls even wild animals. At least, many of the wild animals that are difficult to capture are caught in this way, when they take no heed of their own safety because of their feelings for their offspring and, off their guard, fall into the hunters’ hands. Indeed there is no animal so weak that it doesn’t shield its offspring; no creature so gentle that it isn’t enraged when its children are killed. But she dissolved the tyranny of nature that extends both through rational human beings and through irrational animals. And not only didn’t she attack the tyrant’s head, not tear his face apart, when she saw her cubs being torn apart, but she displayed so great an excess of philosophy as to even prepare for him his inhuman meal and, while the first children were still being punished, to encourage those left to experience the same tortures. 8. Let mothers hear these things, let them emulate the woman’s courage, her love for her offspring. Let them raise their children this way. For giving birth is not the defining characteristic of a mother, for that is a matter of nature; instead, a mother's defining feature is raising her child, for that is a matter of choice. And that you may learn that it isn’t giving birth that makes a mother, but raising them well, hear Paul crowning the widow, not because of giving birth, but because of her raising of her children. For when he said: “Let a widow be enrolled who is no less than sixty years of age, who has been observed in good works” (ITim 5.9-10), he added the ultimate in good works. What is it? He said: “If she has raised children.” He didn’t say: “If she has produced children” but “if she has raised children.” So then, let’s reflect on what it’s likely that the woman suffered—if, that is, one should call her a woman—when she saw fingers shaking over burning coals, a head sailing off, an iron first pounding the head of another child, and skin tearing away, and the child suffering these tortures still standing and talking. How did she open her mouth? How did she move her tongue? How did her soul not fly from the flesh? Let me tell you how. She didn’t look towards the earth, but prepared herself for all the blessings to come. She feared just one thing: that the tyrant would spare some and stop the contest early, that he would split up the group of children, that some would remain uncrowned. And because she was afraid of this, she all but took the last one in her hands and put him in the cauldron, using in place of her hands the comfort and advice of the words she addressed to him. We cannot hear of other people’s ills without pain, yet she viewed her own without pain. Let us not just simply hear these things, but let each listener project the entire tragedy onto their own children. Let each sketch the longed for face and, outlining for themselves the darlings, paint these sufferings on them, and then they'll know well the power of what I’ve said. Rather, not even by doing this. For no sermon can come close to the sufferings of nature; only experience teaches them. 9. It’s timely following the crown of her seven children to address to her that saying of the prophet: “You are like a fruitful olive in God's house” (Ps 51.10). After all, in the Olympic games, although frequently a thousand athletes enter, the crown is given to just one. But here from seven athletes there are seven winners crowned. What estate could you show me that’s so productive? What womb so fruitful? What births like these? T he mother of the sons of Zebedee became the mother of apostles, but of just two (cf. Mt 10.2). I know of no single womb that produced seven martyrs and itself in turn added to their number, not just in the addition of a single martyr, but in that of many more. 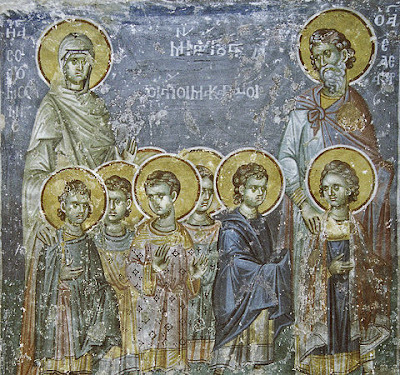 For while her children were just seven martyrs, their mother’s body, though it was just a single body when added, filled the space of fourteen martyrs, both because she was a witness for each and every one of them, and because she fashioned them into such witnesses, and so bore for us an entire Church of martyrs. She gave birth to seven children and gave birth to none for the earth, but all for heaven; rather, for the King of Heaven, having born them all for the life to come. 10. And so, the Devil led her to the wrestling matches last for the reason that I started to mention: so that, by first removing her strength in having her watch the tortures, she might be easily overcome when she welcomed the antagonist last. For if people on viewing flowing blood have often felt light-headed and fainted and have required a great deal of care in order to bring back the life that’s abandoned them and the body’s spirit that’s taken flight, what wouldn’t that woman have endured on seeing so many torrents of blood flowing from the flesh of not another person, but her own children? How much confusion wouldn’t have taken hold of her soul? And so for this reason the Devil, as I started out saying, dragged her to the contests after her children to render her weaker. But the opposite occurred. For, instead, she embarked on the contests with confidence. For what reason and why? Because she was no longer afraid, nor did she have to worry over any of her children who had been left behind her here, that they might perhaps weaken and be deprived of their crowns. Rather, having stored them all away in heaven as if in a theft-proof warehouse and sent them to the crowns above and the steadfast blessings, she confidently stripped off for combat with much pleasure. And as if fitting the costliest gem to a crown, she fit her own flesh to her group of children and travelled off to her beloved Jesus, leaving behind for us substantial comfort and counsel; advice through her actions that we should brave every trouble with a healthy soul and lofty mind. For what man, what woman, what old person, what young person who is afraid of dangers brought against them because of Christ will now attain pardon or will have a defense, when a woman, an old one at that, and a mother of so many children, and one who competed before the coming of grace when the gates of Death were still closed, when sin was not yet extinguished, nor death defeated, can be seen enduring with such great enthusiasm and courage so many tortures because of God? 11. Taking all these factors into consideration, let us, women and men, young and old, inscribe her contests and wrestling matches on our heart as if on a tablet and have her endurance stored up in our soul as a perpetual counsel for scorning troubles, so that by imitating the virtue of these saints here, we may be able to share their crowns too there, with us displaying as much endurance in the irrational passions as they exhibited philosophy in their tortures, in anger and desire for money, bodies, vainglory and all other such things. For if we subvert the flame of these things just as they did the fire, we will be able to stand near them, and share the same boldness of speech. May we all attain these blessings through the grace and loving kindness of our Lord, Jesus Christ, through whom and with whom be glory to the Father, together with the Holy Spirit, now and always, and forever and ever. Amen. From The Cult of the Saints: Select Homilies and Letters, Wendy Mayer, Bronwen Neil, SVS Press.